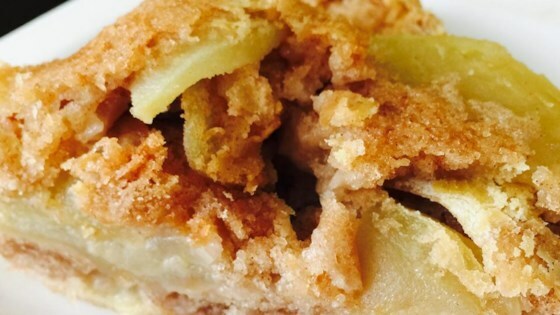 "This German Apple Cake is a moist dense cake that keeps well. It has been a family favorite for twenty years." Preheat oven to 350 degrees F (175 degrees C). Grease and flour one 9x13 inch cake pan. In a mixing bowl; beat oil and eggs with an electric mixer until creamy. Add the sugar and vanilla and beat well. Combine the flour salt, baking soda, and ground cinnamon together in a bowl. Slowly add this mixture to the egg mixture and mix until combined. The batter will be very thick. Fold in the apples by hand using a wooden spoon. Spread batter into the prepared pan. Bake at 350 degrees F (175 degrees C) for 45 minutes or until cake tests done. Let cake cool on a wire rack. Once cake is cool serve with a dusting of confectioners' sugar or with a Cream Cheese Frosting. See how to make a warm German cake frosting with pecans and coconut. Was so excited after reading all the reviews but this is undercooked mush. The outside burned before the inside was done. Very disappointing.